Although the group played through far more than 20 tunes over the two days, Lovano said they chose the ones that “rose to the level of expression that we wanted. We want every tune to have its own feeling — we don’t want any repeats. On Monday, we’ll hear more from Jack DeJohnette and Joe Lovano as they discuss their long careers and their thoughts on music education. 7:00 pm — Film screening with Mark Cantor, filmmaker and collector. “Giants of Jazz,” featuring the music of Duke Ellington, Louis Armstrong, Bill Evans, the International Sweethearts of Rhythm, Thelonious Monk, Stan Kenton, and others. Stull Recital Hall. 8:00 pm — Film screening with Mark Cantor, filmmaker and collector. “The Jazz Vocalist,” featuring performances by Billie Holiday, Ella Fitzgerald, Abbey Lincoln, June Christy, Mel Torme, Lambert, Hendricks and Ross, and others. Stull Recital Hall. 3:30 pm — Panel Discussion: Producing Jazz — Yesterday, Today, and Tomorrow, with jazz studies professor Jay Ashby, Grammy-winning producer Todd Barkan and jazz writer Michael Cuscuna. Stull Recital Hall. 3:30 pm — Faculty Panel Discussion: Amazing Jazz Stories. Guests include jazz & ethnomusicology faculty member Fredara Hadley. Stull Recital Hall. 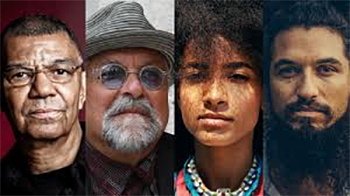 7:30 pm – Oberlin Artist Recital Series: The Spring Quartet, with drummer Jack DeJohnette, saxman Joe Lovano, bassist/vocalist Esperanza Spalding, and pianist Leo Genovese. Program to be announced. Finney Chapel. Tickets are limited and available online.